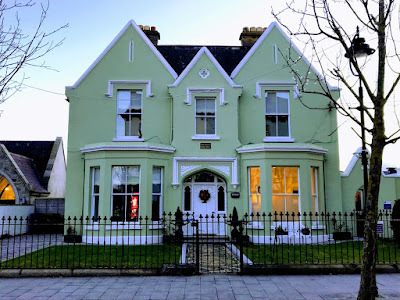 During my walks through the Victorian and Edwardian streets of Bray, Co Wicklow, late on Thursday afternoon [14 December 2017], I was in awe of some of the spending architecture of that era. 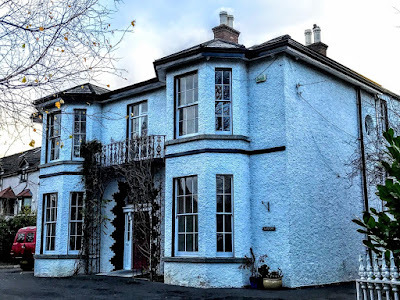 I was writing yesterday about Toner House, the former French School, which was built as a terrace of houses and was strongly influenced by the principles of John Ruskin (1819-1900), the leading English art critic of the Victorian era and the author of The Stones of Venice. Some of the other houses from this period that I stopped to admire and to photograph include Laxton House, Wellington House and Sidmonton House and Wenworth, which form an interesting pair, and the former Presbyterian Manse on Quinsborough Road, which has been renovated in recent months. Laxton House on Novara Avenue is a well-preserved mid-19th-century house, built in 1858. This is a detached, three-bay two-storey house, built in 1858. It retains its original setting, set well back in a mature garden, behind a curved gate screen with wrought-iron gates. The house is finished in roughcast render with stone sills and string courses. But despite the addition of roughcast render, Laxton House maintains the Victorian character of the streetscape. The panelled door is flanked by pilasters and is surmounted by a semi-circular headed fanlight. The opening for this front door is dressed with distinctive block and start quoins. A wrought-iron Regency Style screen sits in front of the door and rises to support a small balcony. To either side is a two-storey canted bay with a hipped roof. The window openings are all flat-headed with either six-over-six or four-over-four timber sash frames. A French window opens from the first floor onto the balcony. The hipped roof is covered with natural slate and clay ridge tiles. There are over-hanging eaves and the rainwater goods are cast-iron. The chimney-stacks are rendered with corbelled caps and clay pots. Wellington House is a 10-bedroom house on Novara Avenue. Built around 1905, it is a striking example of an early Edwardian house with mild Tudor overtones that add diversity and richness to the rhythm of the streetscape. In 2001, Wellington House was on the market at €825,329, this was then reduced to €634,869. 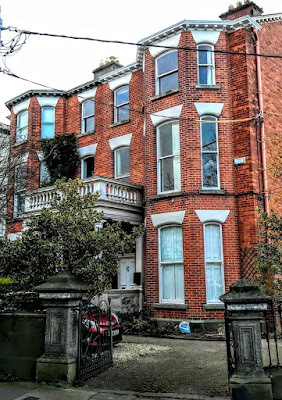 This is a detached, three-bay 2½-storey house, built in red brick with granite dressings. The front door has a plain fanlight, all set within a flat-headed opening, below a stone balcony with turned balusters supported on a free-standing column and anta pilasters all of Tuscan order. To the east side of the house is a two-storey gabled bay on which is placed a canted two-storey flat-roofed bay. The house is slightly set back behind a low rendered wall with square gate pillars that have decorative pyramidal caps and a wrought-iron gate. Sidmonton House on Sidmonton Road was built about 1890. 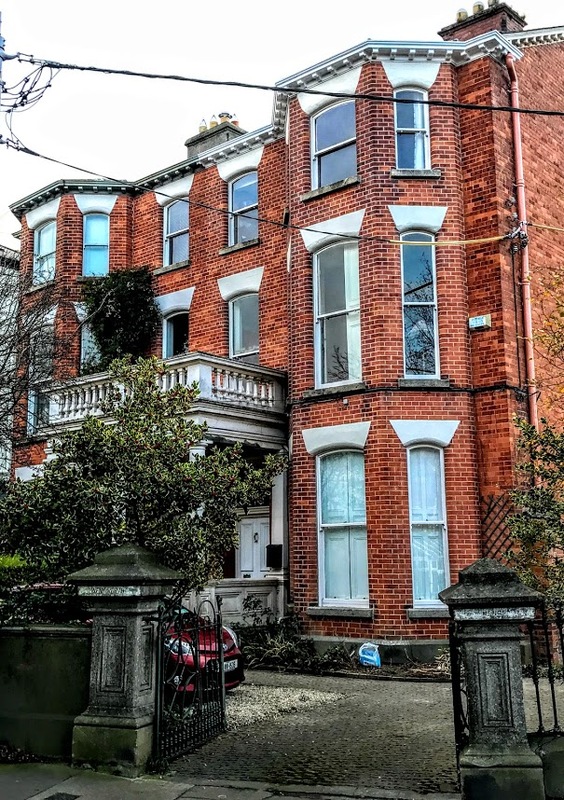 This is a five-bedroom, semi-deatched, Victorian redbrick house with bay windows overlooking Sidmonton Park to the front and a ‘secret garden’ at the rear. The ground floor accommodation includes a dining room, kitchen and family room. The family room to the rear leads to the utility and shower room. Upstairs is the formal drawing room with a bay window and balcony. There are two double bedrooms and a bathroom on this level, with another two double bedrooms, a study and a shower room on the top floor. The artist was Charlie Whisker, who has worked on music videos in the US for artists such as Bruce Springsteen and Bob Dylan; the writer was the novelist Julia Kelly, whose first, With my Lazy Eye won best Irish newcomer in 2008. 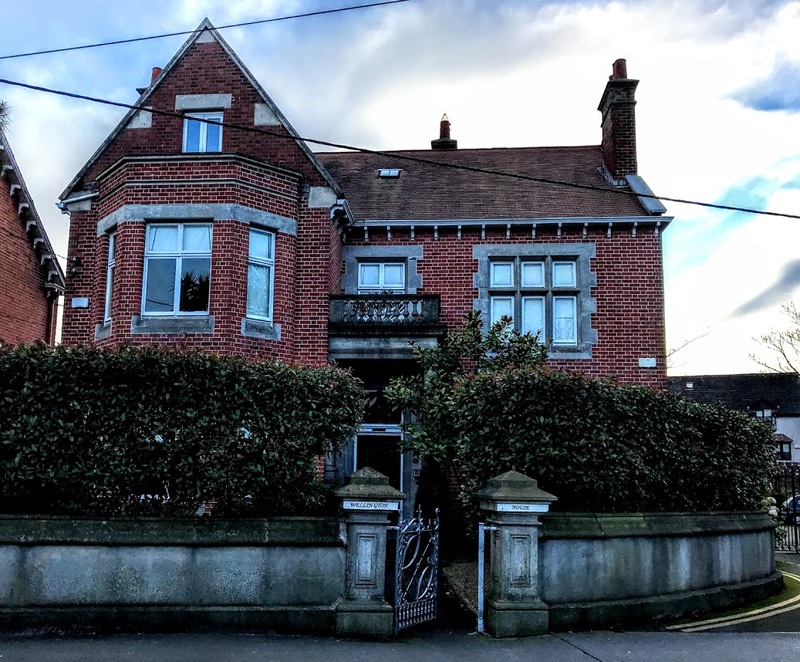 They had reportedly bought Sidmonton House for over €1.75 million. 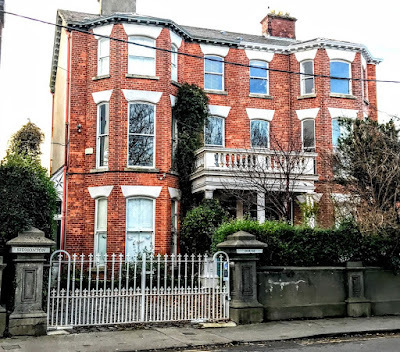 When they put the house on market again through Vincent Finnegan in 2013, it had an asking price of €995,000. Wentworth House next door is the matching pair of Sidmonton House, making a delightful set of semi-detached late Victorian houses. As I walked back into Bray along Quinsborough Road, it was good to see the former Presbyterian Manse has been refurbished by the recent buyers. Last year, this five-bedroom house at No 13 was on the market. The former manse, beside Saint Andrew’s Presbyterian Church, is a detached, three-bay two-storey house, built in 1850 before Dargan had completed his plans for Quinsborough Road. The front elevation consists of three gables, with the gable to the centre smaller but projecting slightly, and with single storey canted bays to the outer ones. The façade is finished in painted render with moulded drip stones to the entrance and upper floor windows and small ‘arrow loop’ and quatrefoil recesses to the gables. 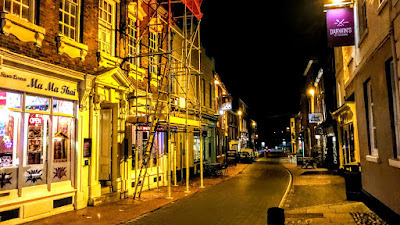 The pitched roof is slated and has rendered chimneystacks and rendered parapets with corbels. The entrance is set within a small recessed porch with a Tudor-style arch opening, and consists of a timber door with ogee-arched panels, pointed arch sidelights and a three-pane pointed arch fanlight. There are decorative spandrel panels between the porch opening and the drip stone above it. The windows are flat-headed and have two-over-two timber sash frames. The house has cast-iron rainwater goods. When it was on the market last year, the estate agents Quinn Agnew said the main section of the property is in residential use with a living room, kitchen, dining room, and utility areas on the ground floor, and five bedrooms on the first floor. The rest of the ground floor and side mews area is let to the dental practice with separate pedestrian access. Since then, the house has been sold and lovingly restored. 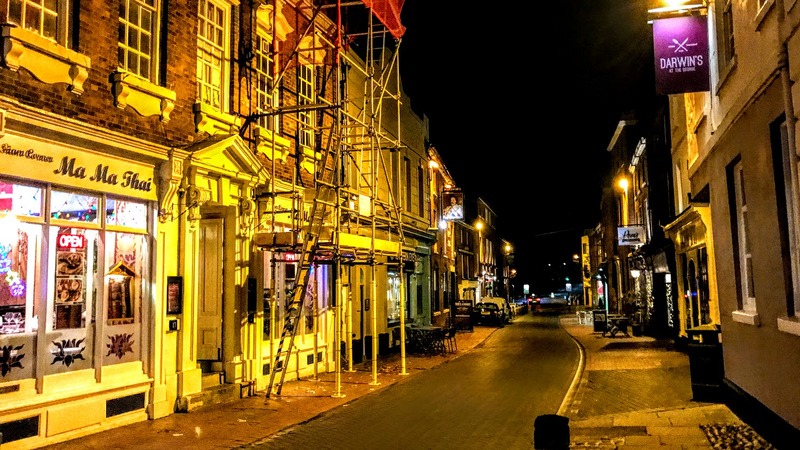 There are Christmas lights and decorations in the windows, and another part of Bray’s Victorian heritage has come back to life at the right time of the year. We have come to the end of the second week of Advent. Throughout this season of Advent, I am inviting you to spend a short time of prayer and reflection with me each morning, using the prayer diary of the Anglican mission agency USPG (United Society Partners in the Gospel) and the Advent and Christmas Devotional Calendar from Lichfield Cathedral. Pray for guidance to Ghana’s political leaders, local chiefs and all in positions of leadership. Pray that they might lead by example and serve the people. Today, the calendar suggests reading Matthew 1: 1-17. As the preparations for Christmas intensify pray for the people who shed light and hope in the world and all who serve us each day. Pray for shop workers and delivery staff today. Sirach 48: 1-4, 9-11 or II Kings 2: 9-12; Psalm 80: 1-4, 18-19; and Matthew 17: 10-13.